1.Upper blade and lower blade are made of special material and durable. 2.Minimize the shearing stress to avoid micro-cracks of the soldering joint. thinkness of cutter can fit to different width of V-groove. 4.Easy and convinence to change the cutter . 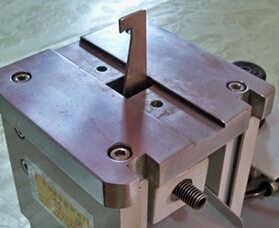 the quality of cutting ,otherwise, easy to move the supporting pin . 7. The thickness and the height for cutter can be custome made . 8.Easy to fetch and give for waste box.